Can Drinking Coffee Help You Lose Weight? Perhaps you have heard arguments in favor of using coffee as some sort of weight loss supplement. As the thinking goes, drinking coffee as your primary beverage during a weight loss campaign can help you lose weight by suppressing your appetite. But is it true? And if so, how much coffee would you need to drink to realize any genuine benefits from doing so? There are opposing opinions on both sides of the question. So to get to a credible answer, we consulted the Mayo Clinic website. According to contributor Katherine Zeratsky, R.D., L.D., caffeine may help with weight loss efforts somewhat, but there is not enough evidence to prove that increased caffeine intake results in any amount of significant weight loss or helps keep weight off. Proponents of using coffee as a weight loss supplement point to the caffeine found in the beverage as being the helpful ingredient. Caffeine is found not only in coffee but also in a long list of other beverages including cola, tea, energy drinks, etc. Even makers of weight loss pills put caffeine in them. Caffeine allegedly works as an appetite suppressant, thereby helping you eat less. But as Zeratsky points out, the suppressing effects of caffeine are only temporary. Unless you are constantly drinking coffee throughout the day in order to keep the level of caffeine in your system stable, there will not be enough of an appetite suppressing effect to help in the long run. Coffee is also pushed as a weight loss supplement in the belief that caffeine has thermogenic properties. Thermogenesis is the process by which your body creates heat as it digests food, burning calories as it does so. Again, Zeratsky says there is insufficient evidence to prove that the thermogenic effects of caffeine are strong or consistent enough to be of any help for weight loss. It is possible that there is anecdotal evidence of caffeine (specifically coffee) helping people lose weight. The fact is there are always some things that seem to work for a small handful of people even if they do not work for everyone else. So both Zeratsky and the Mayo Clinic suggest that anyone who intends to use coffee or caffeine-containing products to help lose weight do so wisely. As for coffee specifically, using it as a weight loss supplement dictates that you drink it black. It will not help at all if you load it up with cream, sugar, and all the calories that come with them. Also be careful of specialty coffees. These tend to be high in both calories and fat. 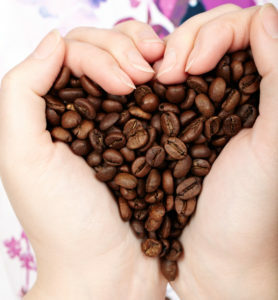 Here at Galaxie Coffee, we are in the coffee business because we love coffee. If drinking coffee is helping you lose weight, good for you. We are here to supply our clients with the best beverage service in the greater New York area, weight loss debates notwithstanding. We would be happy to supply your office with a full range of beverages and break room supplies.